If you are concerned with getting a seat for a show that may sell out, we open 45 minutes before showtime and you can purchase your ticket early, place a hat, coat or scarf on a seat and return later. We cannot guarantee that your ‘reservation’ will be honored by other patrons, but find that this system works pretty well since our patrons are quite respectful. Do you qualify for senior ticket pricing? Please don’t make us guess; tell us BEFORE you purchase your non-matinee tickets. Thank you. We accept MoviePass but NOT Fandango Gift Cards, or any other online movie tickets. We also welcome cash, local checks, and credit cards. We accept Apple Pay, Google Wallet, and smart chip cards. We also accept most major credit and debit cards, including MasterCard, Visa, Discover and American Express. We also accept local checks and cash. The minimum debit/credit card charge is $5.00. Do you have a NEW chip credit card? If so, be prepared to know your PIN! Some (not all) chip credit cards won’t process without it. We suggest having another credit/debit card to use, or have cash on hand if you don’t know your PIN. Did you know its less expensive for us to process your purchases when you use a credit card ($.05 per transaction) than when you use a PIN debit card ($.20 per transaction)? Most people think its the other way around, so they choose to run charges as a debit. 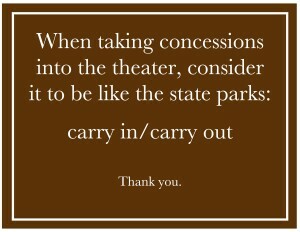 Here at Peterborough Community Theatre, we prefer that you choose credit whenever possible. That way we can keep our concession and ticket prices low. The use of cameras or recording devices of any kind is strictly prohibited inside the theater. We are a movie theater, not a restaurant. If you’re looking for soup, sandwiches, ice cream, beer, coffee, pizza, or hot dogs, there are a number of restaurants downtown that offer such fare. Theater boxes of candy too big for your taste? 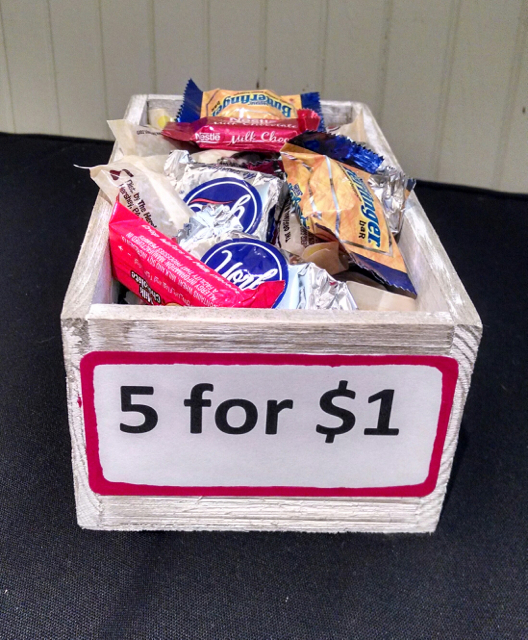 We offer mini chocolate bars! Our GMO-free popcorn is pure, clean, and NOT cooked in anything fake, just canola oil. We use only real sweet cream butter, when you request it, and we offer celery salt, fine salt, Jane’s Crazy Mixed Up Salt, nutritional yeast and many other toppings like dill pickle, chili lime salt, savory bacon, sour cream and onion and other fabulous flavors for your popcorn. Shake N’ Share popcorn bucket lids for our large size popcorn! 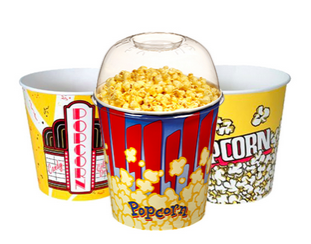 Each lid is only $1 and fits onto the bucket so you can shake to evenly coat the popcorn with butter and seasonings. 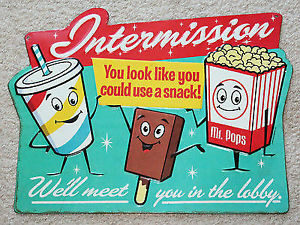 Once in the theater the Shake N’ Share Lid can be used as a bowl to share! Parents and grandparents now have the ease in portioning out a proper serving for the kids. 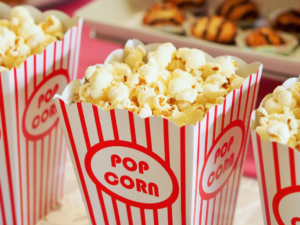 Groups of patrons can enjoy the popcorn without reaching and causing a mess. And if you have leftovers, the lid can seal back on to take home to enjoy later. Drinks are $2.00 and we offer a variety of bottled sodas, lemonade, iced green tea, and orangina. Bottled water is $1.00. Our water comes in 100% recycled plastic bottles that are BPA free. Feel free to bring in a reusable water bottle to help protect our environment from single use plastics. Bringing in coffee in to-go cups is fine with us too! Better yet, a reusable lidded coffee cup! Candy is $2.00 a box. We have recycling bins by the door on your way out. Please put your bottles in the bin, thank you!